Our client, age 34, had gone out to dinner with a friend. He had downed several beers, but felt fine to drive when he left the restaurant. Article in Short Form: Client runs out of gas on 110 freeway, CHP officer fails to record when our client last drove, making breath test given meaningless under Vehicle Code § 23152(b), license reinstated. 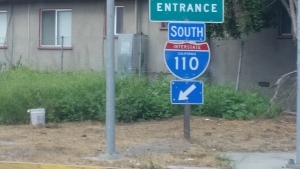 As he drove south on the 110 Harbor Freeway in his brother’s car, which he was unfamiliar with, he suddenly felt the car run out of gas (this is a common problem with our DUI clients even driving their own cars – they just fail to look at the gas gauge when they are drunk). Our client estimated the time at that time to be about 11:00 p.m. The client navigated the car over to the right side of the freeway on the transition ramp to the northbound 405 and began making phone calls to his girlfriend to come and get him, but she was asleep. His phone battery then ran out of power, so he decided to walk to the next freeway off ramp to call for help and/or get gas. He walked about half way to the Vermont Avenue exit, which he believed was a solid mile away, and then decided to turn around and return to stay with the car and try charging the phone from the car since car’s battery still worked. As he started doing so, the CHP arrived. He could see their headlights in the car’s rear-view mirrors. The client estimated that a full hour had passed since he last drove by the time the CHP arrived. The CHP officer did not immediately notice any odor of alcohol in our client at first. Accordingly, he called a tow truck and then began recording our client’s personal information. It was at this point that the officer allegedly noticed the client’s flushed face, bloodshot eyes and slurred speech. This was approximately ten minutes after the officer arrived on scene. The officer then began administering field sobriety tests (FST’s). He then asked if our client wished to give a breath test to measure his blood alcohol content (BAC) at the scene. Smartly, our client declined, asking instead to take a test at the CHP station. It is worth noting for the reader here that one may legally decline to submit to a breath test at the roadside, as well as refuse to perform field sobriety tests under Vehicle Code § 23612(i). The tow truck then arrived and there were problems hooking up the client’s brother’s car to the tow. The CHP officer did his best to assist the tow truck driver, taking another twenty minutes. Our client was thereafter arrested. Ironically, the CHP station was less than a mile away from the location where our client ran out of gas, but it took over two hours after the CHP officer arrived on scene for the officer to ultimately have our client provide a breath sample. After our client was booked, he was released and called Greg Hill & Associates. He met with Greg Hill, who listened to the client explain what had happened. Greg’s experience in similar cases to this made his spot the likely issue of the BAC being measured more than three hours after the client last drove. This meant that the BAC measured would not be presumed under Vehicle Code § 23152(b) to be the BAC for the driver when he last drove. Greg Hill & Associates then reserved a DMV hearing for the client and received the CHP report, which revealed the client’s breath sample was taken 2 hours and 22 minutes after the CHP officer arrived on scene. Given that our client tried to walk to the Vermont exit and then back before the CHP officer arrived at the scene, it was likely that the breath sample was not taken within three hours of when our client last drove. At the DMV hearing for our client, the DMV was made aware of all of these delays and time issues. It realized that the exact time of when the client last drove was stated nowhere in the CHP Report. Greg brought this to the DMV’s attention, which surprisingly agreed. When the DMV ruling arrived, our client was ecstatic. His license was reinstated. He was fearful that he would not be able to drive for his job, so the reinstatement of his driving privileges was a big relief. His work involved a great deal of travel to Canada, where having a valid license is important. When our office received the ruling, we notified the prosecutor’s office in Compton and explained the issues. The DA’s office in Compton apparently agreed, as they declined to file any criminal charges against our client.